This is an interesting Conical Maiden set. We are unsure what region of the USSR these dolls come from, but they go quite fast whenever they appear on eBay. 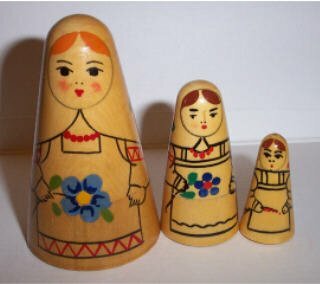 The dolls have a conical shape, and are plain wood with a very simple outlined design for their dresses. The two largest dolls hold a single blue flower and the smallest holds a twig of berries. According to a seller Vladimir in Russia, these cone shaped dolls come from Naro-Fominsk in Moscow Region. Made in a Wooden Toys Factory, the Russian name of this doll is Alyonoushka.